Now, last month, I did a show called "How to be More Masculine," and it was very, very successful enough. It would only be fair to turn the page, to flip the coin, to do how to be more feminine. You might be, "Luke, how can you tell us to be more feminine? You are not a woman." Last time I checked, I wasn't, and, "You do not sound like you're in touch with your feminine side, because you are such a badass," as I put myself over, because somebody has to. But I thought it would be fair to do a show for the women out there, for the feminine energy. So, we know in this world we have a masculine energy, we have feminine energy. And so, think of the law of polarity. And typically, the more masculine a man you are, the more feminine a woman you will attract into your life and be attracted to your life. The reverse is true. The more feminine you are as a woman, the more masculine a man you will be attracted to and will attract into your life. Now, as a man, we have masculinity, we have femininity. We have both polarities within us. And as a woman, you also have femininity, a polarity in yourself, the opposite polarity, which is masculinity. And I have known women that have been very masculine who were dating in relationships with guys that were very feminine, and it worked for them. It's not the kind of relationship that I would want to want because of the masculinity that I have. But it worked for them. So yeah, we both have both. But today's episode is about helping you, as a woman, to be more feminine. Because I've seen this, for want of a better word, kind of nasty, nasty kind of change or transformation in the world where it's not okay to be a feminine woman, it's not okay to be a woman, it's not okay to be loving, to be nurturing, and all the amazing feminine energies that you have out there. It's not okay to do that, because you got a big compete with men, because we're all equal. No, we're not. We're not equal. We're human beings, but men and women, I'm sorry to say, we are not equal. We are different. Men have a particular set of skills that women do not have. Women have a particular set of skills that men do not have. We are different. We are not equal. We have our strengths, we have our weaknesses. Not to say one is better than the other, but we are different, and we are not equal. 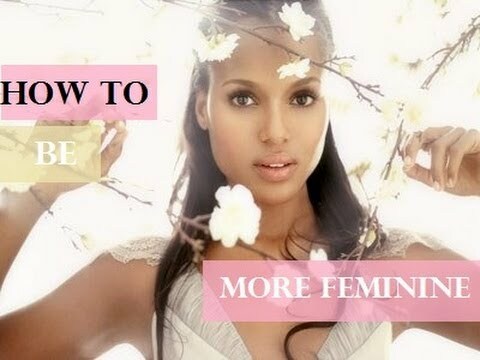 So, how to be more feminine. Well, men typically are mission-based, are always coming from the head. Whereas a more feminine woman is in her body. She expresses herself more through her body, her feelings in her body, in the way that she moves her body, and the things that she says is more attuned to her body and how she feels, and the intuition, as opposed to a more masculine person, a more masculine man who's more coming from the head and from the mission that he has there. So, the first thing to do as a woman is drop down, actually drop down, inside your body. Feel your body, feel the earth underneath your feet. Dress a way that makes you feel more feminine. Look a way that makes you look more feminine. Have your hair in a way that makes you feel more feminine. That helps to nurture that inside of you. Because the feminine energy is all about expressing yourself, being in your body. More oftentimes, the masculine energy is all, again, being mission-based, being in our head. Neither is right, neither is wrong, we are just different. But to be more feminine, stop thinking so much. Stop living from your head. Live through your body, through your movement, with the way your clothes feel, the way you flow, through the way you move through the world. Drop inside your body. That's the first way to become more feminine, to get in touch with that feminine side. Another thing to do is, again, typically as guys, we're coming from the head, we're thinking all of the time, and we're mission-based, head-based, not very much in our bodies. Whereas a woman is typically coming from a place of more intuition, a place of more feeling. So, multiple times a day, maybe set a reminder on your cellphone, women out there. Just check in with yourself multiple times a day and ask yourself how you're feeling right now. What are you feeling right now? Because the feminine energy is expressed through feelings, not through thoughts. So, check in with yourself. Express the feelings that you're feeling, the body sensations that you're going through, the emotions that you're going through in that point. Explore them, be there. Ask yourself, "Why am I feeling this? How am I feeling this? Could I feel this more? Could I feel this less? Where's this coming from? How am I feeling? What am I feeling? What's this all about?" But be there, bask in it. Check with yourself multiple times a day. This will drop you in your feminine energy, which helps you to radiate more feminine energy outside of you, right there. Number three. Now, how to be more feminine, how to have a more feminine energy. Realize that the feminine energy is a receiving energy. Feminine energy is receiving, whereas masculinity, masculine energy is more providing. Feminine energy is more intuition, where masculine energy is more thinking. Realizing, as a feminine energy, it's about receiving and it's about nurturing, that giving, that loving, that motherly kind of energy that you have. So, make sure that you nurture yourself multiple times a day. That might be running yourself an amazing bath with candles, with some beautiful music in the background. It might be getting a manicure. It may be getting a pedicure. It may be getting a massage. But some way that you are receiving. Maybe you're receiving love from your children, from your friends, from your parents, from your male counterpart, your lover. But actually being receptive, being open, receiving these gifts, that's how to increase, that's how to be part of your feminine energy, to receive things, to receive energy, to receive touch, to receive that protective masculine presence around you. Ask yourself, "What do I need to do right now? What do I need to give myself right now in order to feel more love inside of me that I can give to other people as a woman?" And again, like I say, it may be some form of pampering. It may be some form of exercising. It may be some quiet time, some meditative time. It may be some exercise. It may be reading a book. But receiving, nurturing that lovingness, nurturing that spirit inside, enabling it to grow. Letting it enable to grow. The fourth way to increase your feminine energy is to bring yourself into the moment, the present moment. You see, the feminine energy is present. It's only alive in this very moment. The masculine energy is always future-driven. It's always in the future at some point. It's never grounded in now. Feminine energy is grounded. It's in the moment. It's reacting to how you feel in this moment. It's about being present. It's about being in your body at this particular moment. It's about doing what you need to do in this particular moment, to express yourself physically. "The Power of Now," to quote Eckhart Tolle. That's the difference between a feminine energy and a masculine energy. As men in a masculine energy, we're always in the future, building things, creating things, thinking about our mission, thinking about the next land to conquer. Feminine energy is grounded in the now. It's nurturing, it's here, it's present right now. So, how can you nurture your present? Well, start multiple times a day and ask yourself what time is it. The answer's always the same. It's now. What time is it? Now. It's 5:00. What time is it? It's now. It's 10:00. What time is it? It's now. It's 3:00. What time is it? It's now. That's the only time that matters.